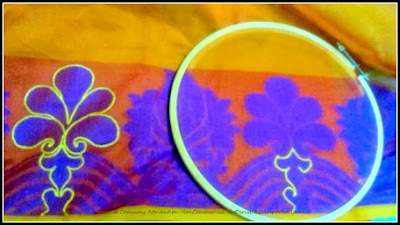 I bought a cotton silk saree with single-color thread weaved as borders; top border being Red, and bottom one being Purple. The Purple border didn't stand out, and therefore, I decided to outline the border motifs with hand embroidery. Currently, I am using Chain Stitch for the flowers as shown in the photo. Chain Stitch is an easy stitch and versatile too. For other motifs, I plan to use Running Stitch and other suitable stitches. I shall update this post with photos of the different stages of embroidery. Updated on Nov 6, 2013: Learn stitches from Sarah's website!